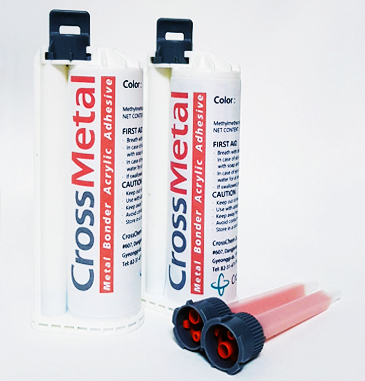 The newly developed metal bonder CrossMetal is two-component acrylic adhesive that has excellent shear, peel, and impact performance for metal working. This new product of CrossChem provides super durability, not only on different kinds of metal substrates, but also on plastics including FRP products and natural stones. Expensive epoxy adhesive can be easily replaced with this economic Acrylic Metal Adhesive. Metal fabrication : Automotive parts, Elevator steel interior, Aluminum honeycomb etc. Electronics parts : BLU of Note PC, Mobile, Home appliance etc.